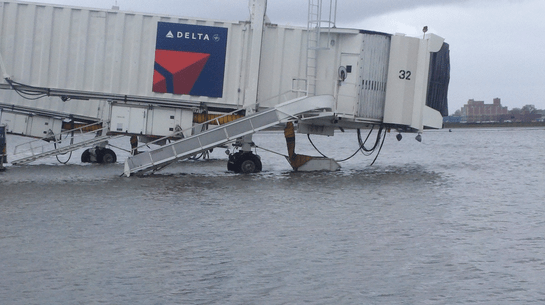 The LaGuardia was flooded by hurricane Sandy. NEW YORK CITY AIRPORTS. One of three of New York City’s three major airports was closed on Wednesday, after the attack of hurricane Sandy. New York City‘s LaGuardia airport was still partly under water and remained closed, but both the JFK and Newark airports have resumed business, though slowly, according to media reports. Latest information is available through the NYC Port Authority’s Twitter flow, https://twitter.com/NY_NJairports. Boston and Philadelphia airports and the three airports serving the Washington/Baltimore area are open with limited service, CNN reports. Amtrak is offering modified service from Newark, NJ, going south—but trains going north are suspended, Condé Nast reported. See the system’s website for more info.